Much of using table manners in Thailand and observing proper food etiquette is familiar and common sense. Don't talk with your mouth full, don't point with your fork, and so on. But there are a few rules of table etiquette in Thailand that differ from the West. In Thailand, cooking and eating the world-famous cuisine is taken quite seriously. But Thai people are fun and easygoing when it comes to socializing. As a guest, your accidental infractions at the table will be forgiven. Mealtimes are often rowdy, informal affairs with talk, drinks, and laughter. Relax and enjoy the cultural exchange! Unlike in the West where the "head" of the table is the most important, the host or highest ranking person usually sits at the middle of the table in Thailand. If you are the honored guest, you will sit opposite of the host so that you can more easily talk. Wait until you are seated; someone will undoubtedly show you your chair. If sat on bamboo mats on the ground, always position yourself in a way that you can avoid showing your feet to anyone while they eat. Note: If you are dining solo in a busy restaurant, you may be asked to share a table with a group who has one empty seat. If this happens, there is no obligation to force small talk or attempt to interact with the other party at the table. All group meals in Thailand are shared; don’t plan to order your own food. Per custom, the senior ladies at the table will pick and choose dishes to fit the group. Several types of meat and fish may be represented along with some different vegetables. If there's something you want to try, ask the person ordering about it and they may get the "hint." Rice will be served in separate bowls. If you have special dietary restrictions, no need to make them heard during the ordering. Just don’t reach for dishes you think could be a problem, and politely decline if someone asks you to try something that doesn’t fit into your diet. As a guest, people will probably hope that you try some local specialties. But if you're absolutely certain you can't eat what is offered, politely declining is nicer than leaving it on your plate uneaten. You’ll be given a plate or bowl of white rice and possibly another bowl for any soups to be served. When the food arrives, put only small amounts — no more than two spoonfuls — of a few dishes with some sauce onto your rice. You can refill your plate as many times as you like until you have tried everything on the table. Ensure that everyone has had a chance to try each dish. Taking too much of any one item — and possibly preventing others from trying it — is rude. Another good reason not to overindulge from the start is that food probably won’t arrive all at once. Dishes will continuously be brought out to the table as they are ready. The best stuff may still be coming! When dipping from the serving bowls on the table, taking from the edge is more polite than dipping the spoon into the middle. Try not to take the last bit from a communal bowl. That should be left for the host, who in turn, may offer it to you anyway. Note: Unlike when dining in some other Asian countries, you aren't obligated to finish all of the rice on your plate in Thailand. Regardless, you should try not to waste food. In Thailand, chopsticks are really only used for standalone noodle dishes. Even if you prefer chopsticks and want to show that you know how to use them politely, Thai people don’t use them for rice-based dishes. 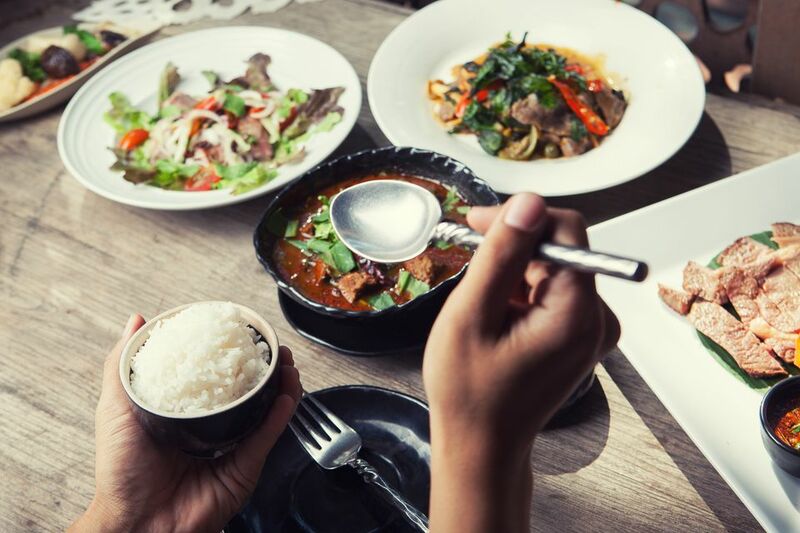 In Thailand, people eat with a spoon in the right hand and fork in the left. The spoon is the primary utensil; the fork is only used to manipulate food. Only items not eaten with rice (e.g., chunks of fruit) are OK to eat with a fork. There won’t be knives on the table, or anywhere outside of the kitchen for that matter; food should already be in bite-sized pieces. If you need to cut food smaller, use the edge of your spoon to cut it, resorting to the fork only if necessary. Meals from northern provinces such as Isan may include glutinous “sticky” rice served in little baskets. Eat sticky rice by compressing with your right-hand fingers and using it to scoop up food and sauces. Hold the spoon in your right hand and fork in the left. Eat with the spoon. Don’t put the fork into your mouth. Use the fork to push food onto the spoon. Eat sticky rice with your fingers; you should use your right hand. Thai people love to season and spice things up. Unlike in upscale Western restaurants or nice sushi establishments, you don’t have to worry about insulting anyone by adding extra sauces and seasonings to your food. But taste a dish first — some authentic Thai food can be especially spicy! As in most Asian cultures, age and social status are given top priority. The rules of saving face apply at all times. Before you begin doing anything, wait for the highest ranking or most senior person at the table to signal that it’s time to eat. If they don’t say anything, simply wait for them to begin their meal. Throughout much of the world, the left hand is considered the “dirty” hand. Avoid handling food and communal serving utensils with your left hand. The rule of avoiding left-hand use especially applies to enjoying items such as sticky rice that is eaten with the hands. Unlike other hurried cultures, eating in Thailand is generally enjoyed slowly. Don't be in a rush to finish dinner and get on to other things. You don't want to be staring at an empty plate while everyone else talks and picks for another hour. Slow down, socialize, and be present. For obvious reasons, avoid spending time on your smartphone at the table. Beer, often one of Thailand's medium-bodied lagers, is frequently consumed with dinner. Make a habit of not pouring your own drinks; someone will probably refill your glass for you. Keep an eye on your neighbors' glasses and top them off as a friendly gesture. And don't act surprised if someone adds ice to your glass of beer! At the end of the meal, ideally, your plate should not look like a crime scene. Consolidate all the inedible pieces (e.g., stalks of lemongrass, bones, etc) on one side of the plate. The same applies to dropped rice and food bits: there shouldn't be anything left on the table around your bowl. Try not to leave food on your plate, particularly meat and vegetables from the main dishes. To indicate that you are finished eating, place your spoon and fork together on your plate. At the end of the meal, don’t immediately reach for the bill to check the damage. And certainly don’t argue over who will pay. Your host may have already asked for the check, or the group may be planning to split it. Per custom, the host or more senior — often the perceived wealthiest — person at the table is expected to pay. In some instances, particularly in relationships between Thais and Westerners, the farang (foreigner) is expected to get the check. Fortunately, food in Thailand is typically very affordable. If you offer to chip in, do so only once, and don't insist if your offer is declined. Tipping in Thailand isn’t customary in authentic restaurants, however, you can allow the staff to keep the change if you like. A service charge is often already added to the bill in nicer restaurants. Don't talk or laugh with your mouth full of food — no exceptions! Don't blow your nose at the table. Excuse yourself to the bathroom. Don't use a toothpick without covering your mouth with your other hand. Don't be the first to bring up business matters. Wait on the other party to switch modes. Don't make noises while you eat. Unlike in some other Asian countries, slurping soups and noodles isn't a good idea. Don't forget to thank your host with a polite kawp khun khrap|kha (thank you male|female) at the end of the meal.